A four-in-a-row game for four players. The grid and the number of players is doubled for more challenge and fun. 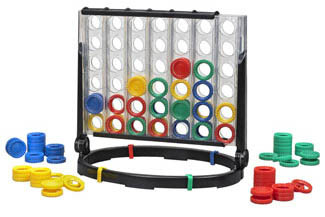 Take turns dropping a checker into the grid to create a line of four checkers horizontally, vertically, or diagonally, just like the original Connect 4. The double-sided grid allows you to make a line on either side, or by weaving through from one side to the other.